According to Variety, Ben Affleck has become the first director to be offered the opportunity to helm Warner Bros.' upcoming Justice League, and then most likely turn it down, citing some sort of scheduling conflict or other obfuscating reason to hide the fact that he doesn't want to touch it. The studio has reportedly already begun the process of approaching Affleck, no doubt reminding him of how much they enjoyed The Town, Gone Baby Gone, and the upcoming Argo, and telling him that they would so love to see him bring those same gritty, grounded sensibilities to a larger tentpole picture—probably a sales pitch very similar to when they previously offered him films like Gangster Squad and Man Of Steel before Affleck politely refused, finally agreeing to film The Stand more or less out of pity at this point. While nothing is official yet, Affleck is expected to pretend to consider the project for an obligatory day or so, before similarly saying thanks but no thanks to spending the next several years on the onus of mounting Warners' Avengers competitor and rebooting Batman post-Christopher Nolan—almost assuredly saying something about "having too much respect for the material" or something like that, all while thinking to himself, essentially, "Fuuuuuuuuck that." 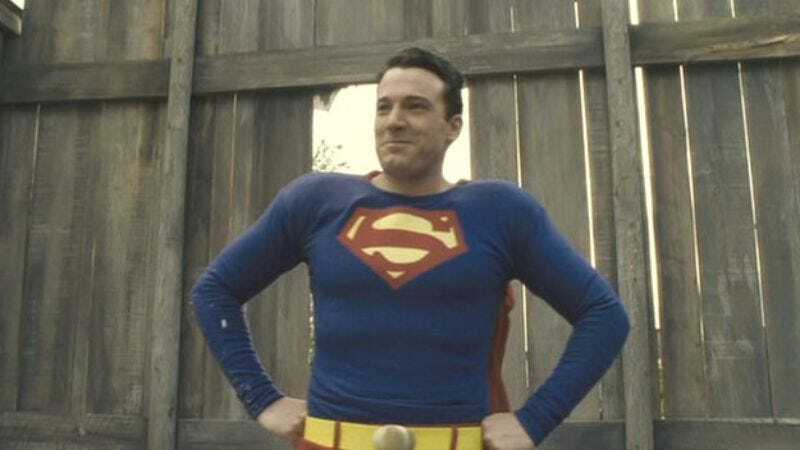 Affleck is also expected to wish that people writing about it won't dig up that obvious Hollywoodland photo of him in a Superman suit.